Tony Trischka has crafted a definitive banjo lesson library with hundreds of online video lessons. Students have unlimited access to in-depth banjo instruction, tablature, backing tracks, interviews and performances with dozens of bluegrass legends. 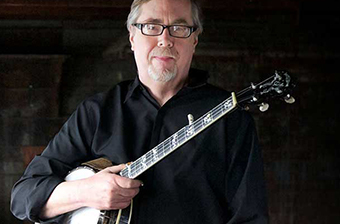 Learn essential skills from one of the world's top banjo players. What ultimately sets these banjo lessons apart from other offerings is the ability to submit a video for review using the ArtistWorks Video Exchange Learning® platform. Tony reviews each submission and records a video response, offering specific guidance to take your playing to the next level. All students can access the Video Exchange library and watch each other’s interactions with Tony. This library is constantly expanding and may contain the key to unlock your playing. For nearly 40 years, Tony Trischka has been an inspiration for countless bluegrass and acoustic musicians. Tony made his recording debut with the band Country Cooking in 1971. Since then, he's recorded numerous solo albums, collaborated with artists like Peter Rowan and Stacy Phillips, and produced Steve Martin's Grammy-nominated album Rare Bird Alert. His 2004 album Double Banjo Bluegrass Spectacular also received a Grammy nomination and multiple IBMA awards. He has continued to push boundaries as one of the world's top banjo players, lending his expertise as music director for the documentary "Give Me the Banjo". Tony has taught banjo lessons at ArtistWorks since 2009, building a global learning community around his Video Exchange library. “Ode To Joy” Preamble -NEW! Important Reminders From Tony -NEW! 2-3 Hammer-On Instead of 2-3 Slide -NEW! Roll with No Name - “Shortnin' Bread” -NEW! Roll with No Name - “Cripple Creek” -NEW! “Cripple Creek” - Up the Neck -NEW! Backup Off Beats - 3 Different Ways -NEW! “Wildwood Flower” - Earl Scruggs Version -NEW! 20,000 Leagues Under the Banjo: “Cripple Creek” -NEW! “Shenandoah” - All Forward Rolls, All the Time -NEW! Melodic Style Part 12: “Big Sciota” - Down the Neck -NEW! The Bodacious Blend: Scruggs & Melodic - Introduction -NEW! The Bodacious Blend: Scruggs & Melodic - “Boil Them Cabbage Down” -NEW! The Bodacious Blend: Scruggs & Melodic - “Oh Susanna” -NEW! The Bodacious Blend: Scruggs & Melodic - “9 Pound Hammer” -NEW! Melodic Style - The Key of C - Etude -NEW! Melodic Style - Key of C - "Oh Susanna" -NEW! Melodic Style - Key of C - "Billy in the Lowground" -NEW! Moveable Lick Pattern: 2 Frets Apart -NEW! 3 Finger Single String - “June Apple” -NEW! 3 Finger Single String: “Three Toed Rabbit” -NEW! "Loch Lomond" in Double C Tuning -NEW! “Liberty” in Double C Tuning -NEW! “Cumberland Gap” Alternate Tuning -NEW! “Cumberland Gap” Alternate Tuning - A Part Variation -NEW! The Dorian Mode - Part 1: The Dorian Scale -NEW! The Dorian Mode - Part 2: Dorian Etude 1 -NEW! The Dorian Mode - Part 3: Dorian Scale Pattern in 3/4 Time -NEW! The Dorian Mode - Part 4: Dorian Etude 2 -NEW! Invaluable, comprehensive, enlightening beyond words. Tony Trischka teaches more than just "how" on the banjo - he is an encyclopedia of bluegrass history. And his interviews with some of the great banjo heroes/legends are fascinating! Thanks! I really enjoy taking banjo lessons. I have no musical background and Tony breaks everything down so even I can understand it. It’s also really great being able to take lessons on my schedule and whenever I’m ready. I never ever thought that I would be able to learn a brand new instrument without having an actual instructor teach me how! No schedules, and you can work at your own pace. Plus, it's a great option for people who live in places that don't have access to instructors. Seeks to constantly improve the service and the web site. ArtistWorks is with you all the way. They answer your e-mails as soon as they possibly can. I'm sure they get tons of e-mails. I am student and will be doing more with Banjo. I love the site and Tony Trischka. He's a great teacher and having the interaction and wealth of materials to learn from has been very helpful to me. Great way to learn to play an instrument in your underwear if need be! I have been using this site for Banjo instruction and tips of the trade and feel I'm getting great value. I have the ability to to not only read the instructions but to hear what it is supposed to sound like. Great way to learn or increase your musical chops. If you want to learn more about how to play the banjo, regardless of your level, and you're willing to put time into playing, this is for you. Tony Trischka has a tremendous amount of knowledge and skill -- as a player, as a teacher, as a student and as a scholar of music. He has boundless enthusiasm and generosity -- seems like he'll do anything to help anyone on the site. And he's genuinely understanding and compassionate about the frustrations and discouragement that we all feel from time to time. Whenever anyone asks me about lessons, I ALWAYS recommend TTSB on ArtistWorks. A great service to budding and experienced musicians. Like having your own, excellent, personal teacher. I've been playing for many years but am constantly amazed at the new techniques and ideas I learn from Tony Trischka. Love it. Good afternoon, Tony T is a great teacher and artist- and I am terribly shy when it comes to performing and/or submitting a video to him or anyone else for that matter- I know I have to get over it. No reason- other than my own personal issues. have not utilized the video feed back portion - but I have watched his teaching videos- utilized a some of the audio performance assistance and mostly the music tablature for songs and exercises. The tools and materials available are all great, but really it Tony Trischka! I started playing banjo 16 months ago and I am very happy with my progress. Artistworks has tremendous amount of tools to help you learn and advance. The convenience is great for me. I don't have to commit to a schedule or time to add more pressure to my already busy life. Aside from all that, I get to have one of the best teachers available. I'm a member of TT School of Banjo. Tony is great and his lessons are geared to several levels of players. The music + section and interviews are a real plus as is the forums where you can ask direct questions of Tony and share info among other members. The video exchanges are also a learning experience, though I haven't ye submitted my own.